Holzworth's RF Synthesizers Modules were originally designed as the internal, tunable LO test sources for Holzworth phase noise analyzer products. Due to the need for easy integration, the HSM Series designs incorporate a long list of electrical and mechanical features to satisfy the demanding requirements of today's high performance communications systems and integrated test systems. FIELD PROVEN RELIABLITY with MTBFs exceeding 240kHrs. 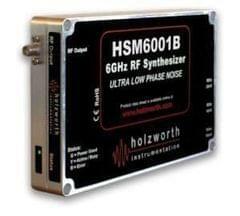 The Holzworth HSM Series RF Synthesizers are microwave CW sources that are architected on a non-PLL based platform. The digital-analog hybrid design provides excellent phase noise performance and spurious response, which compliment the phase coherentnature of these digital-analog hybrid signal sources. The HSM Series offers several models that cover increasingly wider bandwidths so users can best match an application requirement while optimizing the price point. The frequency switching speed of the HSM Series is faster than most. Unlike PLL based architectures, the non-PLL based HSM Series does not exhibit any significant settling time after a frequency change. Settling time is not always clearly specified in PLL based synthesizer datasheets even though it is often a large contributor to the overall switching speed. Pulse modulation "burst mode" does not require an external stimulus signal. The programmable self pulse modulation function exhibits very fast rise and fall times with minimal overshoot or ringing. The screen shot shown here demonstrates an approximate 10ns risetime (Tr) when operating at a frequency of 500MHz. The pulse width is approximately 100us in this example. Refer to the product datasheet for more details. The native I/O interface for the HSM Series is via SPI, which is preferred for most integrated applications. When used with an HCM1 (USB Communications Module) or an HCM3 (Ethernet Communications Module), each synthesizer module can be controlled with the Holzworth Application GUI or directly via addressed command lines.